A direct-current generator in which the poles presented to the armature are all of the same polarity, so that the voltage generated in active conductors has the same polarity at all times; a pure direct current is thus produced, without commutation. Also known as acyclic machine; homopolar machine; unipolar machine. (also acyclic machine), a direct-current generator without a commutator that operates on the basis of homopolar induction. 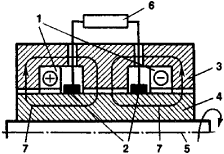 In a homopolar generator, two toroidal field coils are located on the stator and are wound coaxially with the shaft (Figure 1). The coils produce a constant magnetic flux in an annular air gap between the stator and the armature. In the simplest case, the current is collected directly from the lateral surface of the armature, which is a solid metallic cylinder or disk, by moving brushes. In more complicated designs, the moving and stationary components of the current-collecting assembly are separated by a layer of liquid metal. Figure 1. Schematic diagram of a homopolar generator: (1) field windings, (2) current-collecting assembly, (3) stator, (4) armature, (5) axis of rotation of the generator shaft, (6) external load, (7) magnetic lines of force of the field coils. The minus sign and the plus sign indicate the direction of the current in the coils (out of the page and into the page, respectively). Homopolar generators are used mainly to obtain high currents (~104–105 amperes) at low voltages (~1–10 volts). The advantages of such generators include a reliable and simple design, a relatively small size, and high thermal and dynamic stability. The current produced by the generators does not pulsate. Homopolar generators are employed as the power supplies of, for example, high-power electrolysis equipment, arc furnaces, electromagnetic pumps for liquid metals, and DC electromagnets. Bertinov, A. I., B. L. Alievskii, and S. R. Troitskii. Unipoliarnyeelektricheskie mashiny s zhidkometallicheskim tokos”emom. Moscow-Leningrad, 1966.